The Cape Florida Light is on the southern tip of Key Biscayne just east of Miami. It is one of Florida'a oldest lighthouses; it was built in 1825 to help shipping avoid the treacherous Florida reef. It operated until 1878 when its role was replaced by a new light offshore at Fowey Rocks. The Coast Guard reactivated the light in 1978 to help guide ships into the Florida Channel into Biscayne Bay, but it was deactivated again in 1990. In 1966 the lighthouse property was included in Bill Baggs Cape Florida State Park, and has been lighted again since 1996. It is now owned and operated by the Florida Department of Environmental Protection. The lighthouse and keeper's quarters have been restored and the lighthouse is open to the public. Guided tours of the lighthouse and lighthouse keeper's cottage are given twice daily, Thursdays through Mondays. Climb the 95 steps of the lighthouse tower for a fantastic view of Key Biscayne and Miami. Park admission: $8 per vehicle, limit 2-8 people, $4 for single occupant vehicle or motorcycle. $2 Pedestrians, bicyclists, extra passengers, passengers in vehicle with holder of Annual Individual Entrance Pass. Wikipedia has an excellent article on the history of Cape Florida Light. 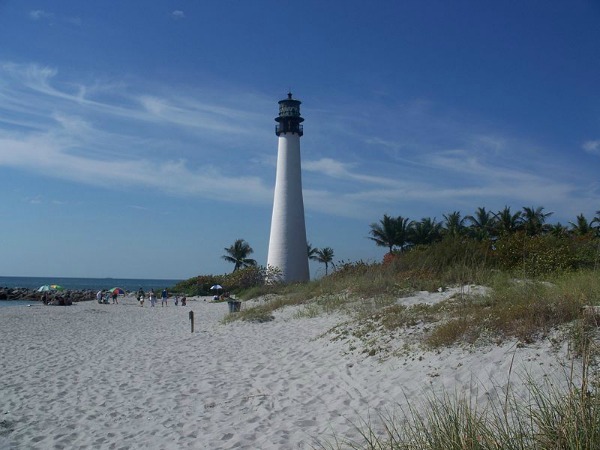 More information about the lighthouse is at Bill Baggs Cape Florida State Park.